Immediately after the Second World War, Dutch cities were in a state of dereliction. The housing stock was falling dramatically short in both quantitative and qualitative terms. Combined with a dysfunctional infrastructure, it presented planners with the situation of an outright emergency. On top of that, this ravaged urban context was soon to be confronted with the birth peak of the postwar baby boom, whereas almost no space for children was available, neither inside nor outside the house. At that time, some playgrounds existed in the city, but almost all of them were of a private nature and based on membership of the fortunate few. 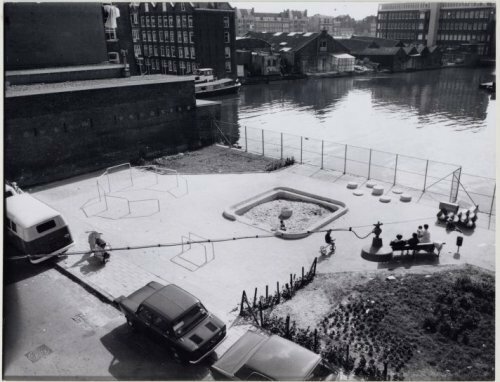 Van Eyck’s playgrounds, initially build on temporarily unused plots of land, can be seen as an emergency measure, but they had a significance far beyond that of a creative solution in a time of need. Postwar urban planning in the Netherlands mainly consisted of a rushed and economized implementation of the prewar ideals of the modernist movement grouped around the CIAM (Congres International d’Architecture Moderne), identified with the work of modernist architects like Le Corbusier, Giedion, and Gropius. In Amsterdam, Cornelis van Eesteren, longtime president of the CIAM, was to implement his General Extension Plan (Algemeen Uitbreidingsplan – AUP) of 1934, one the first modern urban masterplans to be based on extensive statistical forecasts of demographic and transport developments (1). His plan embraced the ideal of functional separation, meaning that housing, work, traffic and recreation where to be functionally separated and integrally planned. This was the basic premise of the large-scale construction of new post-war neighborhoods in the fifties such as Buitenveldert and the Westelijke Tuinsteden, resulting in the well known open housing blocks with large amounts of light, air, greenery and monotony. 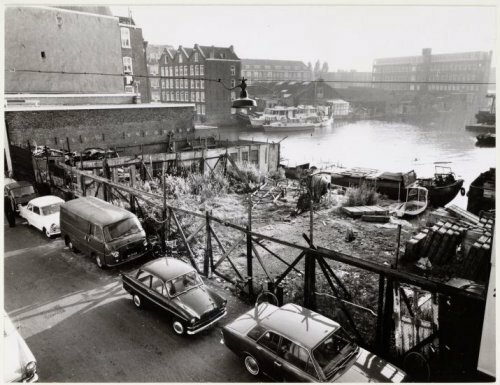 But the agenda of functional separation also resulted in the conclusion that Amsterdam’s economic center, the CBD, had to be further expanded and the old city had to be “opened up” to traffic. This vision was radicalized in the sixties, when the entire city clogged up due to the explosive rise of car traffic, and urban planners introduced a proposal for an extensive network of metro lines and highways to cut through the old fabric of the city. What was on the agenda was a tabula rasa makeover of Amsterdam’s 19th century ring of popular and derelict neighborhoods, the Jordaan, Nieuwmarkt, Oostelijke Eilanden, Weesperbuurt and the Pijp (2). A wholesale urban modernization wave that would form a 20th century version of the hitherto unrealized 19th century Hausmannisation of Amsterdam, much like Robert Moses famously used ‘the meat-axe’ to make space for his parkways and causeways in New York. The Dutch planners, however, never got that far. They were soon to find a huge protest movement on their way that effectively poured sand in the machine, and finally defeated what was by then called the ‘urban bulldozer’ (3). Aldo van Eyck played an important role in defining what would follow. Van Eyck’s path and that of the functional modernist school were initially one and the same. 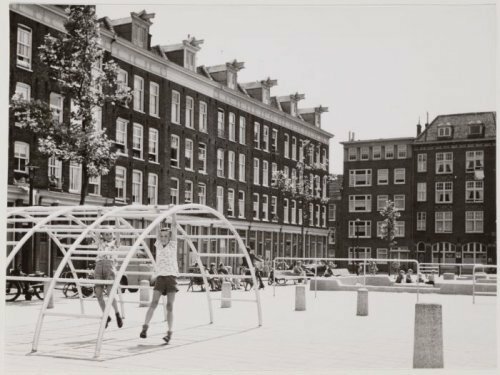 When he started on the playgrounds, Aldo van Eyck worked directly under Cornelis van Eesteren, who was in charge of Amsterdam’s urban development department until 1959. He also began to participate actively in the CIAM conferences (4). 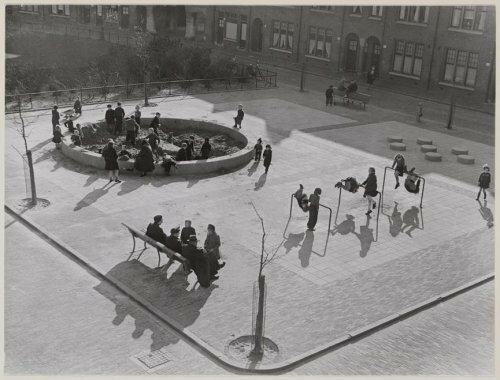 However, the perspective on urban space that van Eyck developed through his playgrounds, would lead him to become one of the most fervent critics of the functionalist tendency that dominated the CIAM movement until then. In 1953, a critical group of young architects formed within the CIAM, van Eyck was one its most vocal members. “Functionalism has killed creativity”, van Eyck stated in an article in the Dutch magazine Forum, “it leads to a cold technocracy, in which the human aspect is forgotten. A building is more than the sum of it’s functions; architecture has to facilitate human activity and promote social interaction” (5). In 1959, this critical group was in charge of the organization of the 11th CIAM conference at the Dutch town of Otterlo, where they did nothing short of declaring CIAM for dead (6). By that time, the CIAM had already lost much of it’s momentum. Out of the organizing group of the Otterlo conference emerged a new platform: Team X. The influential Dutch members, van Eyck and Bakema, were to replace the old rationalist and functionalist approach for a new, modular, and participative architecture under the label of ‘structuralism’ (7). Looking back, we can see that the ingredients for this shift were already present in the playgrounds. 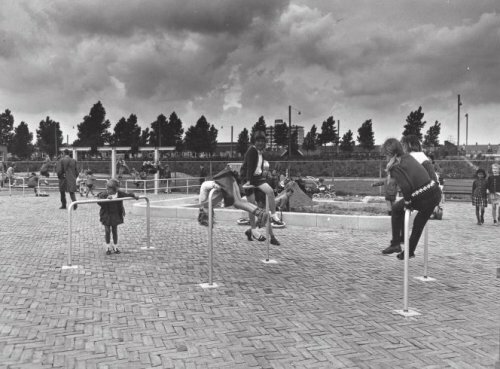 Between 1947 and 1978 Van Eyck designed hundreds of playgrounds, first as part of the Department of Urban Design and later on (in 1952) for the municipality, working for his own office. In the first eight years he designed sixty of them and after that many more, the last ones almost in batches in the new post-war districts. Of the grand total of 700, only 90 survived into the 21st century with their original layout. 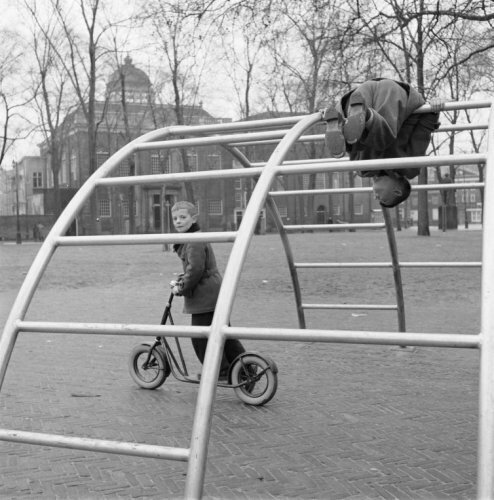 The first playground on Bertelmanplein was a test case. Van Eyck designed a sandpit bordered by a wide rim. In it he placed four round stones and a structure of tumbling bars. The pit was placed in the north corner of the square, diagonally across from three tumbling bars. Bordering the square were trees and five benches. The playground was a success. Many designs followed and, depending on the site, Van Eyck deployed a number of compositional techniques. For him the playgrounds were an opportunity to test out his ideas on architecture, relativity and imagination. Relativity in the sense that connections between elements were determined by their mutual relationships rather than by a central hierarchical ordering principle. All elements were equal: the playgrounds designed by Van Eyck were exercises in non-hierarchical composition (8). 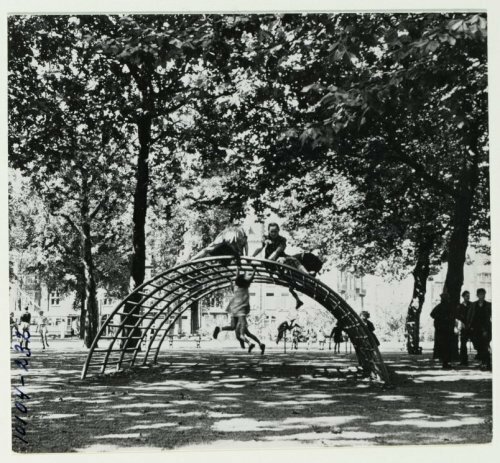 Van Eyck also designed the playground equipment himself, including the tumbling bars, chutes and hemispheric jungle gyms, and his children tested them. To him, playing equipment was an integral part of the commission. The purpose was to stimulate the minds of children. The hemispherical jungle gym was not just something to climb. It was a place to talk and a lookout post. Covered with a rug, it became a hut. These sandpits, tumbling bars and stepping stones were placed throughout the Netherlands. Different elements of the playgrounds represented a break with the past. First and foremost, the playgrounds proposed a different conception of space. Van Eyck consciously designed the equipment in a very minimalist way, to stimulate the imagination of the users (the children), the idea being that they could appropriate the space by its openness to interpretation. The second aspect is the modular character of the playgrounds. The basic elements – sandpits, tumbling bars, stepping stones, chutes and hemispheric jungle gyms – could endlessly be recombined in differing poly-centric compositions depending on the requirements of the local environment. The third aspect was the relationship with the urban environment, the “in-between” or “interstitial” nature of the playgrounds. The design of the playgrounds was aimed at interaction with the surrounding urban tissue. The temporary character of the intervention was part of this “in between” nature, recreating space through incremental adaptation instead of the tabula rasa approach of modernism, in which the designs had an autonomy of their own, based on abstract data and statistics. Of course the use of empty plots was also a tactical solution. Because the Site Preparation Service of the Department of City Development, working together with local associations, wanted to give every neighbourhood its own playground, they often had to be placed in vacant, derelict sites. The focus on how space could be appropriated, stood in clear opposition to the prevailing modernist conception of space in architecture, most famously formulated by Giedion in his classic Space, Time and Architecture. Here he defined the essence of modernist architecture as the merger of space and time, creating the experience of movement (9). Van Eyck’s concerns were of a completely different nature: “Whatever space and time mean, place and occasion mean more. For space in the image of man is place, and time in the image of man is occasion” (10). The question raised was not the emulation of movement towards some unknown horizon, the archetypical uprootedness of the experience of modernity (11), but exactly the opposite: how can people make space their own and create a subjective “sense of place”? How to feel at home in the modern city, this machine of mass rationalization? The transitory playground was “place” and “occasion” combined. The playgrounds were not isolated architectural interventions. Somehow they served as a powerful synthesis, a distillation of some of the most interesting motives that resonated amongst the last avant-gardes in that interesting time span when modernism came under heavy fire, but the general disillusionment of the postmodernist era was nowhere yet in sight. In itself, a playground seems a rather sweet and non-controversial undertaking, but at the time, it also functioned as a crystallization point of cultural critique. In 1949, van Eyck played host to the first exhibition of the Cobra group – a short-lived but influential avant-garde art movement – in the Stedelijk Museum in Amsterdam. The Cobra group drew their inspiration in particular from children’s drawings. They believed that the spontaneity of children’s imagination, untainted by modern protocol, was one of the privileged sites of authenticity in a society where man was to live “in a morbid atmosphere of artificiality, lies and barrenness” (12). The close relationship between Van Eyck and the artists from the Cobra current makes it probable that much of his early inspiration for the playgrounds derived from Cobra: “On the margins of attention there is always the artist, essential companion to the child. His function is too decorative,” Aldo van Eyck stated during CIAM X, Dubrovnic 1956 (13). The Cobra group dissolved only three years after it was founded, but Cobra members Constant Nieuwenhuys and Asger Jorn were to re-appear on the stage as co-founders of the Situationist International in 1958. In that context, also the notion of play gained symbolic importance. In 1938, the Dutch historian Johan Huizinga wrote Homo Ludens (14), a book on the historical importance of the element of play in culture; Constant Nieuwenhuys used the idea as the basis for his critique on urbanism. Much like Aldo van Eyck, he was deeply critical of the functionalist architecture of the postwar period. Together with Guy Debord, he drafted the now famous tract on Unitary Urbanism that proclaimed the advent of a society of mass creativity. Due to mechanization, Constant proposed, Homo Faber, the traditional working man of industrial society, would be replaced by Homo Ludens, the playful man, or creative man, in postindustrial society (15). The Situationists took this element of play and developed it into one of their core notions, as Debord would state: “Due to its marginal existence in relation to the oppressive reality of work, play is often regarded as fictitious. But the work of the situationists is precisely the preparation of ludic possibilities to come” (16). The situationists, whose ideas came to play an important role in the ’68 rebellion, developed the notion of play into a subversive strategy to rebel against modern capitalism and modernist architecture; Le Corbusiers’ authoritarian architecture was portrayed as a form of fascism. With psychogeography and the famous dérive, they changed focus from “streets, buildings and businesses” to how “people inhabit the city and the collective psychic ambiances they project”, much in parallel with van Eyck’s stress on place and occasion. 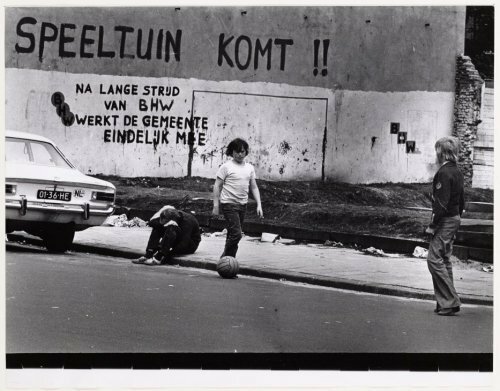 After leaving the situationists, Constant was to play a role in the Dutch spirit of ’68. In his famous utopian work of architecture New Babylon (Van Eyck actually assisted him when he started making scale models), Constant created an explicit metaphor for the advent of a creative society. He saw his ideas on mass creativity materialized in the youth culture of the sixties, where his ideas were taken up by the Dutch yippies, the provo’s, that through playfulness and endless provocation brought the authoritarian spirit of the Dutch fifties down on its knees (17). In the Netherlands, modernist urban planning and the growing anti-modernist spirit of revolt were to have a final confrontation in the Nieuwmarkt neighborhood in Amsterdam. This was the site where the first of the metro-lines – with a four lane inner-city highway on top – was to be constructed, cutting through one of the oldest popular neighbourhoods of the city. Hundreds of students, artists and activists moved into the empty buildings of the neighborhood, where provo’s together with a mix of residents and activists founded Aktiegroep Nieuwmarkt. Years of spirited resistance, and a conclusive violent riot in 1975, led to the final surrender of the modernist planners and the politicians who headed them: the metro-line was finished but the highway was stopped, and all other metro-plans were off the agenda. The New Left came to power and the Nieuwmarkt was saved, to become an inspiration for anti-modernization struggles elsewhere in the country. A new model for urban development emerged – “bouwen voor de buurt” (building for the neighborhood) – that was to replace large-scale modernist intervention for small scale participative projects in the neighborhoods. The “structuralist” architectural philosophy of Aldo van Eyck and the group around the magazine Forum was to become a template for a decade to come. One of the first and most symbolic of these projects was the redevelopment of the Nieuwmarkt itself. Maybe not so surprising, Aldo van Eyck was the architect to work on it. Here, his ideas on interstitial space, non-hierarchical composition, and participative planning led to an architecture that could easily mold into the existing tissue of the neighborhood. “Play”, as Huizinga once said, “is a serious matter”. Published in Ana Mendez de Andés (red.) (2010) Urbanacción 07/09, La Casa Encendida, Madrid, pp. 25-39. 1 Vincent van Rossum (1993) Het Algemeen Uitbreidingsplan van Amsterdam: geschiedenis en ontwerp. NAi publishers, Rotterdam. 2 Gemeente Amsterdam (1968) Voorontwerp tweede nota over de binnenstad. Gemeente Amsterdam, Amsterdam. 3 Bergh & Keers (1981) ‘De Binnenstad als Vrijetijdscentrum’. In: Wonen TA/BK, nr 19, oktober 1981, pp. 2-18. 4 Lefaivre & Tzonis (1999) Aldo van Eyck, Humanist Rebel. Inbetweening in a Postwar World. 010 publishers. Rotterdam. 5 Aldo van Eyck (1959) ‘Het Verhaal van een Andere Gedachte’ (The Story of Another Thought). In: Forum 7/1959, Amsterdam and Hilversum. 6 Louis Kahn (1961) ‘Talk at the conclusion of the Otterlo Congress’. In: Oscar Newman, New Frontiers in Architecture, CIAM ’59 in Otterlo. Jürgen Joedicke (ed. ), Universe Books, New York. 7 W. J. van Heuvel (1992) Structuralism in Dutch Architecture. 010 Publishers, Rotterdam. 8 Lianne Lefaivre & Ingeborg de Roode (eds. )(2002) Aldo van Eyck. Playgrounds. NAi Publishers, Rotterdam. 9 Siegfried Giedion (1980/1941) Space, Time and Architecture. The Growth of a New Tradition. MIT Press, Cambridge. 10 Aldo van Eyck, 1959. 11 Marshall Berman (1982) All That is Solid Melts into Air. The Experience of Modernity. Simon & Schuster, New York. 12 Cobra #4, 1949, cited in W. Stokvis (1980) Cobra. Geschiedenis, voorspel en betekenis van een beweging in de kunst van na de tweede wereldoorlog. De Bezige Bij, Amsterdam. 13 Aldo van Eyck, 1959. 14 Johan Huizinga (1952/1938) Homo Ludens. Proeve eener bepaling van het spelelement der cultuur. Tjeenk Willink, Haarlem. 15 Mark Wigley (ed. )(1998), Constant’s New Babylon. The hyper-architecture of desire , 010 Publishers, Rotterdam. 16 Guy Debord (1958) Contribution to Situationist Definition of Play, Internationale Situationniste #1, June 1958, Paris. 17 Richard Kempton (2007) Provo. Amsterdam’s Anarchist Revolt. Autonomedia, New York. 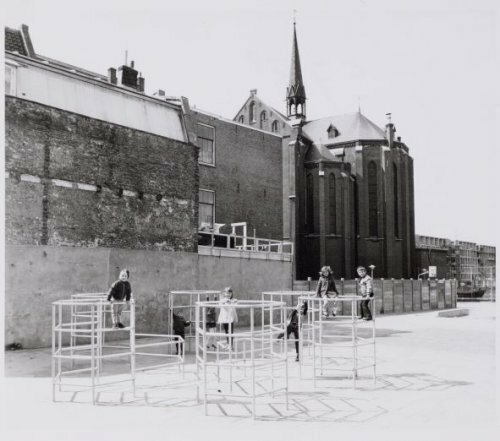 Aldo van Eyck and the idea of filling up the city with playgrounds! Very inspiring text about a very inspiring person.